On June 27, 2015, the II International Seminar of Education and Training Observatories entitled "Observatories between School and Society" will be held in the Faculty of Psychology and Education Sciences of the University of Porto, organized by the Observatory of Life in Schools (OBVIE) of the Centre for Research in Education (CIIE). This seminar aims to be a space to share knowledge and experiences of Observatories of Education and Training developed with differente parties in various formal and non formal educational contexts. 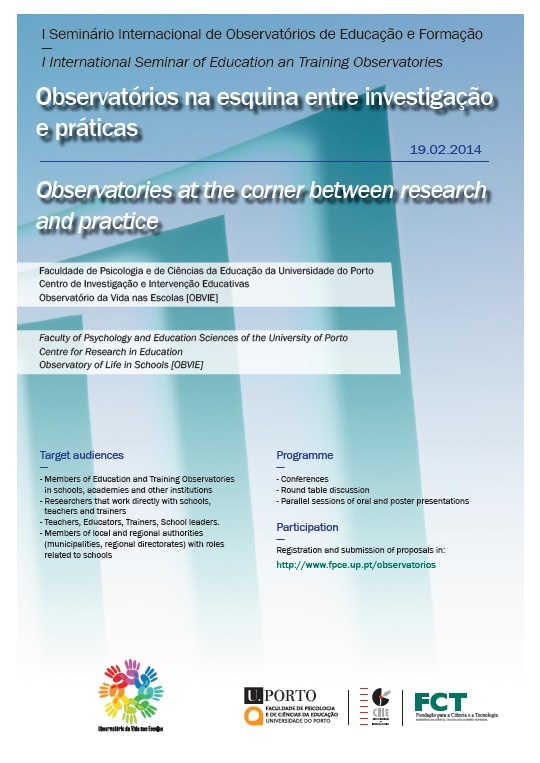 On February 19, 2014, the I International Seminar of Education and Training Observatories entitled "Observatories at the corner between research and practice" will be held in the Faculty of Psychology and Education Sciences of the University of Porto, organized by the Observatory of Life in Schools (OBVIE) of the Centre for Research in Education (CIIE). This seminar aims to be a meeting point for members, knowledge and experiences of Observatories of Education and Training in various contexts: schools, academies and other institutions. All presentation proposals (oral or poster) involve the submission of an abstract of 200 words, through an email to obvie.ciie@gmail.com.